Kyanite is a translucent blue aluminium silicate. It is a member of the triclinic crystalline family. 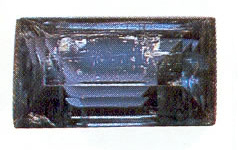 The crystals are shaped like long, flat blades with irregular streaks of differing shades of blue and brown. It affirms a sense of divinity and sacredness of the physical body, so that it can be easier to make healthy lifestyle changes.